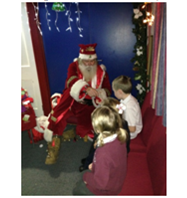 What a wonderful week, we’ve had, starting last Friday with the Christmas Fayre. We are really getting into the Christmas Spirit and looking forward to more special events next week. We all thoroughly enjoyed the Christmas shows that we saw this week. All of us were able to see West End in Schools’ ‘Aladdin’ pantomime on Monday. The children joined in with singing and, of course, shouting. The older children also went to Brentwood Theatre to see ‘Danny, Champion of the World’, which was excellent, as I’m sure they have told you. We hope to repeat these events in future, so any feedback would be appreciated. I am sure you will agree that the Fayre was a great success. It was lovely to see so many of you there. I would like to say a huge ‘thank you’ to all of those who organised the Fayre and helped on the day. They put so much effort into making it a really special event. We do not have a final figure for the amount raised, because the Grand Draw has not yet taken place. Please return your Grand Draw tickets by Wednesday, as it will be drawn onThursday in assembly. Do you have raffle ticket number 55? If so, you have won the large hamper. If no one claims the prize by Wednesday, it will go back into the prize draw. Please encourage your children to have Christmas Lunch on Wednesday 17thDecember. It will be a very sociable occasion, followed by a Christmas film for the whole school. The children (and staff!) will be allowed to wear their own ‘Christmassey’ clothes that day. Christmas lunch is the same price as a usual school dinner: £2.10 and will be free of charge for all Reception, Year 1 and Year 2 pupils. Please make arrangements, if you can, to join us for our Christmas service at St John the Evangelist Church on the last day of term. The service will start at 1.30pm and the children will go straight home from there. It promises to be a very special occasion. Congratulations to Dylan Patel, Maansi Chagger and Sidonie Holmes for earning their pen licences this week. Pen licences are awarded for consistently neat, joined writing. This week’s award goes to Dhiya Chagger for her contribution to the school and for living up to our school motto. I would like to say a huge ‘Well done!’ to Reception class (class 4) for having 100% attendance this week. Please note: there will be no clubs next week. You will receive information about next term’s clubs in January. Thank you to all staff who have run clubs this term.